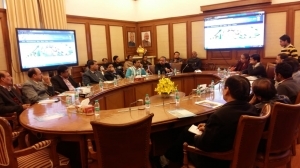 With the great success of eSamikSha portal, Shri K. Rajaraman, Additional Secretary Department of Economic Affairs, Ministry of Finance had desired to host DEA-eSamikSha similar to eSamikSha with minor customization for the use of Department. DEA-eSamikSha monitors the compliance status for various categories like Budget Items monitored by Minister of Finance & Secretary, DEA, etc. Customized Information Dashboard also presents the statistical view, various correspondences at a glance. Demonstration of eSamikSha was held on 19th December 2018 for group of officials from Department of Economic Affairs, to explore the potential of eSamikSha for their department’s use. 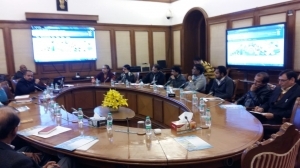 As desired by Shri K. Rajaraman, Additional Secretary Department of Economic Affairs, Ministry of Finance, demonstration session of new DEA-eSamikSha portal was organized on 04th January, 2019, presented by Shri Akash Kumar Gupta, Scientist- ‘B’, Cabinet Secretariat Informatics Division to explore the utility of eSamikSha for Department of Economic Affairs and how the DEA-eSamikSha will cater the need of department. In this context, capacity building training program was conducted on 18th January, 2019 for the officials of Department of Economic Affairs, in ‘Sam-melan Kaksh’, Ministry of Finance. Training session has been taken by Shri Yogesh Agarwal, Scientist ‘B’ of the Cabinet Secretariat Informatics Division, started description about the DEA -eSamikSha followed by audio/visual presentation and the workflow of DEA- eSamikSha users Training has been attended officials of Department of Economic Affairs & its attached offices. During the training session all the modules of DEA-eSamikSha and various roles of respective users have been explained in detail.